Introducing World Missions, the first volume in the Encountering Mission series, provides readers with a broad overview of the biblical, theological, and historical foundations for missions. It considers personal and practical issues involved in becoming a missionary, the process of getting to the mission field, and contemporary challenges a mission worker must face. This valuable guide is based on current research and includes numerous case studies that consider important issues, as well as sidebars, charts, and maps that provide further details on topics of interest. Altogether, this is an engaging introduction to the work of missions in the contemporary world. - Publisher Gary R. Corwin is associate editor of Evangelical Missions Quarterly, special representative with SIM (Serving in Mission), and a visiting lecturer at Reformed Theological Seminary in Charlotte, North Carolina. 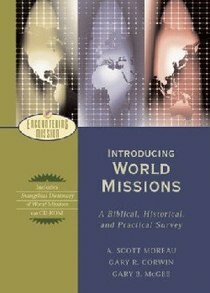 About "Introducing World Missions - a Biblical, Historical, and Practical Introduction (Encountering Mission Series)"
Gary R. Corwin is associate editor of Evangelical Missions Quarterly, special representative with SIM (Serving in Mission), and a visiting lecturer at Reformed Theological Seminary in Charlotte, North Carolina. A. Scott Moreau (D.Miss., Trinity Evangelical Divinity School) is professor of missions and intercultural studies at Wheaton College Graduate School. He is the general editor of the Evangelical Dictionary of World Missions. Gary R. Corwin is associate editor of Evangelical Missions Quarterly, special representative with SIM (Serving in Mission), and a visiting lecturer at Reformed Theological Seminary. Gary B. McGee (Ph.D., St. Louis University) is professor of church history and Pentecostal studies at the Assemblies of God Theological Seminary. Few Assemblies of God educators have attained the breadth of influence achieved by McGee. His extensive college and seminary teaching experience spanned five decades (1967-2008), he was a prolific author, and he helped to build bridges through his leadership in numerous professional and interchurch organizations.He was Distinguished Professor of Church History and Pentecostal Studies at the Assemblies of God Theological Seminary, where he taught since 1984. He previously taught at Central Bible College (1970-1984) and Open Bible College (1967-1970).